Definition: Entrepreneurship refers to the process of creating a new enterprise and bearing any of its risks, with the view of making the profit. It is an act of seeking investment and production opportunity, developing and managing a business venture, so as to undertake production function, arranging inputs like land, labour, material and capital, introducing new techniques and products, identifying new sources for the enterprise. The person who creates a new enterprise and embraces every challenge for its development and operation is known as an entrepreneur. And the undertaking or organisation, typically a startup company, set up by the entrepreneur is called enterprise. Economic Activity: Entrepreneurship is an economic activity, as it involves designing, launching and running a new business enterprises in order to earn the profit, by ensuring best possible use of resources. Creativity and innovation: It involves discovering new ideas and implementing it in business. 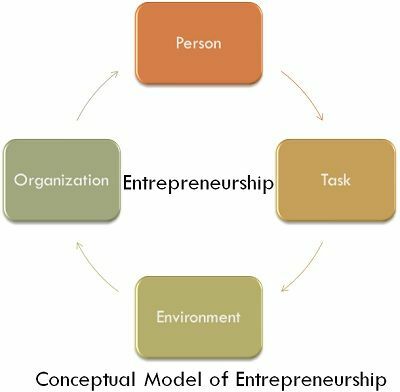 The entrepreneur continuously evaluates current modes of running a business and identifies new methods and techniques for operating the business more efficiently and effectively. Profit: The activity of entrepreneurship is undertaken with the sole objective of making the profit. It is also the reward of the efforts made and risk taken by the entrepreneur. Risk Bearing: “Willingness to assume the risk” is the essence of entrepreneurship without which he/she cannot succeed. It occurs due to the creation and implementation of new ideas. Such ideas are often uncertain, and so the result may or may not be positive and instant. Technical Skills: Oral Communication, ability to organise, productive ability, technical business management, coaching, network building, monitoring environment, ability to spot new trends, active listening, writing and interpersonal skills. Business Management Skills: Forecasting, planning, budgeting, decision making, negotiation, goal setting, human relations, marketing, finance, etc. Personal Skills: Ability to manage change, leadership, persistence, self-reliance, foresightedness, innovativeness, risk taking, self-reflection, discipline, self-confidence, honesty, patience, intelligence, tactfulness, emotional stability, etc. Entrepreneurship operates under an ecosystem called as entrepreneurship ecosystem. The ecosystem comprises of government programs and schemes which encourage entrepreneurship, non-governmental organisations that provide advisory services to entrepreneurs, and other organisations which promote and support entrepreneurship directly or indirectly. Entrepreneurship is not confined to starting a new business but it about facing challenges at each step. It is an important tool for bridging the gap between science and marketplace, wherein a new enterprise is formed and new products and services are brought to the market.